When Grant Wolfe first started to learn how to use the ShopBot Buddy in his Construction Tech classes in school less than three years ago, he likely didn’t realize that he would be helping train Belton High School students on that same equipment today. The skills he developed in operating this equipment was not lost on his Construction Tech Teacher, Craig Sullivan, and when Grant graduated in 2014, Sullivan found himself without one of his best helpers. Construction Tech classes cover a wide variety of skills and Sullivan’s program excelled in multiple areas, but especially in Team Works competitions – where they received state and national recognition. Because of the amount of time it took to cover all these areas and compete at a national level, Sullivan found that he did not have the time he needed to devote to training students on the ShopBot CNC equipment (although the interest level was very high). Knowing that Grant was still in the area taking classes at Temple College, Sullivan decided that there was no better person to assist him in training current students on the ShopBot. His school district agreed and decided to hire Grant on a part-time basis for the year. It may seem unlikely for most students to learn so much so quickly that they would find themselves in demand as a CNC trainer, but not in this case. When Grant saw what this tool could do while in his Construction Tech classes, there was no stopping him. When he wasn’t working on the ShopBot at school, he was busy watching training tutorials and working with the Aspire software at home. As soon as he mastered one concept, he was busy learning a new one. In less than five weeks, after participating in a two-day ShopBot training at his school, he found himself featured in a newspaper article in the Temple Daily Telegram (tdtnews.com). 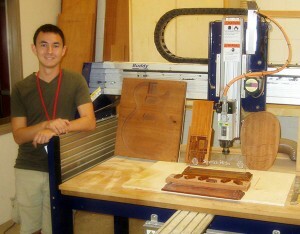 Throughout his junior year, Grant continued to develop his skills on the ShopBot and became one of his teacher’s “go to” students when it came to operating this equipment. In fact, because of the advances being made, and the assistance of Grant and other students, Belton purchased two more ShopBots that year and has since added one more. They now have a total of three Buddies and one Desktop. Throughout the year, Grant continued to amaze his peers, teachers and the entire community with what he could do on this equipment. Before the end of his junior year, the school district approached him and a fellow student, Eric Keis, about building the school’s float for the Independence Day Parade. Keep in mind that this is no small assignment since Belton’s parade has been ranked in the top 10 for the entire country! With the help of Blender and Aspire to design the project, and the ShopBot to do the machining, a true masterpiece was created. 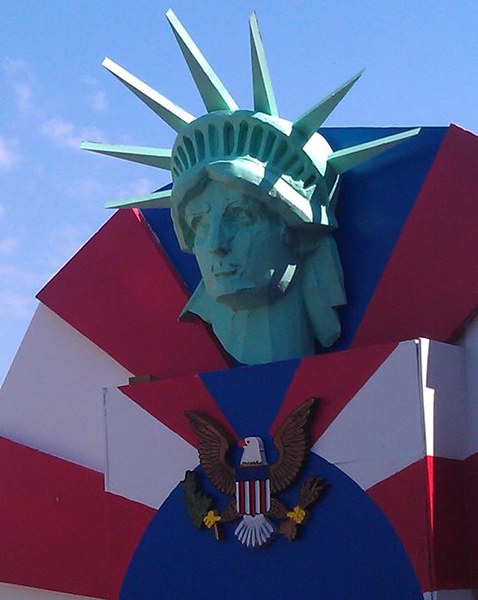 To give you an idea of the size of the project, the Statue of Liberty head alone weighed almost 300 pounds. Other components, including the American Eagle, were also cut to perfection using the ShopBot. To see more details on this project check out this ShopBot blog post. Although his junior year achievements were a hard act to follow, Grant continued to develop his skills during his senior year. He continued to experiment with 3D as well as 2D design work. From numerous award plaques to intricate millwork for local businesses, Grant showed that he was not content to rest on his laurels. 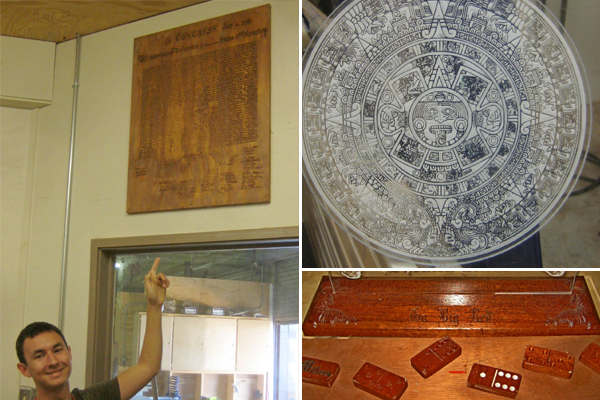 He also started developing his skills with ShopBot accessories such as the Widget Works diamond drag engraving bit and started to learn how to use the ShopBot rotary indexing head. When it comes to using design software and the ShopBots, you could say that Grant went from first grade to graduate school in less than two years. This year, Sullivan already has at least 30 students wanting to learn how to use the ShopBot tools. If the interest continues to grow, Grant just might find himself in line for more than a part-time position. This post was contributed by Brett Dickinson. Read the blog post from 2013.